Binary MLM Software | Binary MLM Software in India | MLM Software in Haryana| MLM Software in Panipat | MLM Software in Panchkula | MLM Software in Kurukshetra. 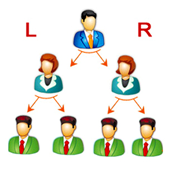 In iSHA MLM Software we have tried to provide the best binary plan for multi level marketing. In order to understand what binary plan is all about and how it is successful, following are the grounds which raised its growth and success. The binary plan we provided is very easy and basic to understand. Precisely, with our binary plan the distributors can with ease counterpart the success and completion of the heads. This is considered to be the best way of accomplishing their networking business.